Slamming Uttar Pradesh Chief Minister Yogi Adityanath over his Ali and Bajrangbali statements Bahujan Samaj Party (BSP) supremo Mayawati said that both Ali and Bajrangbali are ours and this alliance will result into unprecedented outcomes. 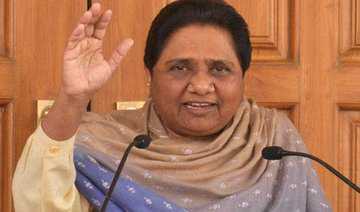 Addressing the election gathering here on Saturday Ms Mayawati said as per secret information of Yogi Adityanath Bajrangbali was Dalit and forest dweller. She claimed that alliance of Ali and Bajarangali will bring happiness for society. BSP president said that wrong policies of Congress brushed out party from most states and Center while BJP also supported capitalism. She claimed that BJP will not be in power despite of any drama of Chaukidar. Urging public to vote for alliance candidate BSP president said that BJP will try to influence public by any means but their promises were fake and public will vote them out. She said that if alliance forms government at Center employment will be provided to youngsters.